Three-hundred years ago today, the Sun King’s light, which radiated over France for seven decades, was extinguished. Louis XIV passed away on 1 September 1715 at 8:15am precisely, days before his 77th birthday, and the reins of government passed into the tiny hands of his great-grandson Louis XV – who, like the Sun King, was only five years old when sovereignty was bestowed upon him. Until the coronation in 1723, however, Louis XV’s cousin, Philip II, duc d’Orléans served the kingdom as regent. The young monarch inherited a very unhappy country with even unhappier subjects: Louis XIV’s unpopularity had been at its zenith when he died. The vast expenditures on warfare, buildings, the arts and the entertainment of his court lead to widespread poverty and uproar. The weight of this troubled inheritance seems even heavier, if one considers the small size of the shoulders on which it now rested – although it is safe to assume that the young boy was unaware of his kingdom’s unfortunate state of affairs. A wonderfully straightforward group portrait in the Wallace Collection, painted shortly after 1715, explains why yet another five-year-old had to become king of France. The fictive depiction of the royal line of succession gathered around the enthroned Louis XIV quotes various individual portraits. 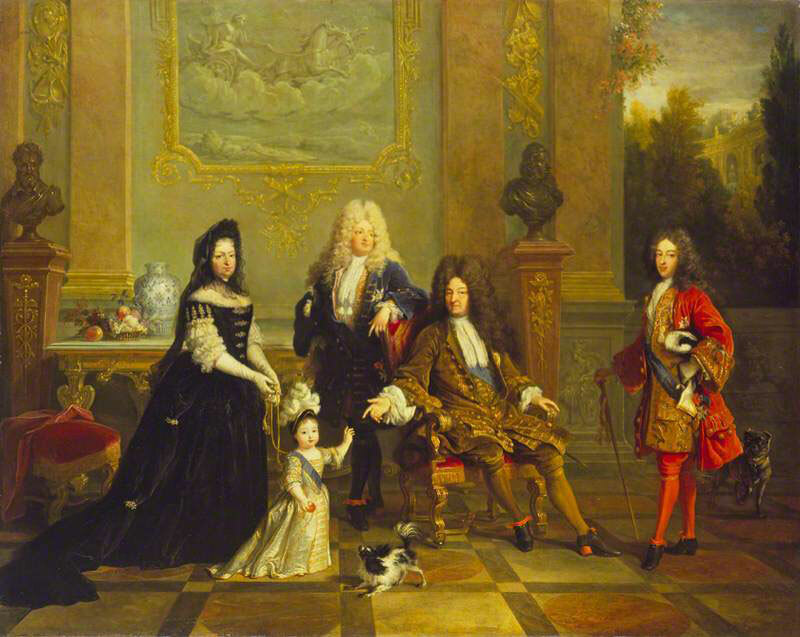 The monarch’s eldest son, the Grand Dauphin, stands casually behind his father, his left arm resting on the throne chair’s back, while the so-called Petit Dauphin, Louis XIV’s grandson, stands self-confidently to the king’s left and gazes at the beholder. The background features a grisaille painting of Apollo in his chariot flanked by busts of the first two Bourbon kings Henry IV and Louis XIII. Between 1711 and 1712, unfortunate circumstances caused the death of the Grand and Petit Dauphins, as well as Louis XV’s older brother, the duc de Bretagne. Thus, a toddler, dressed in innocent white, accompanied by his governess, the duchesse de Ventadour, is represented here as the future of the House of Bourbon. Indeed, the composition is meant as tribute to the governess who protected the young prince from the measles (which had killed his father, mother and brother) and who therefore secured the survival of the dynasty as a whole. 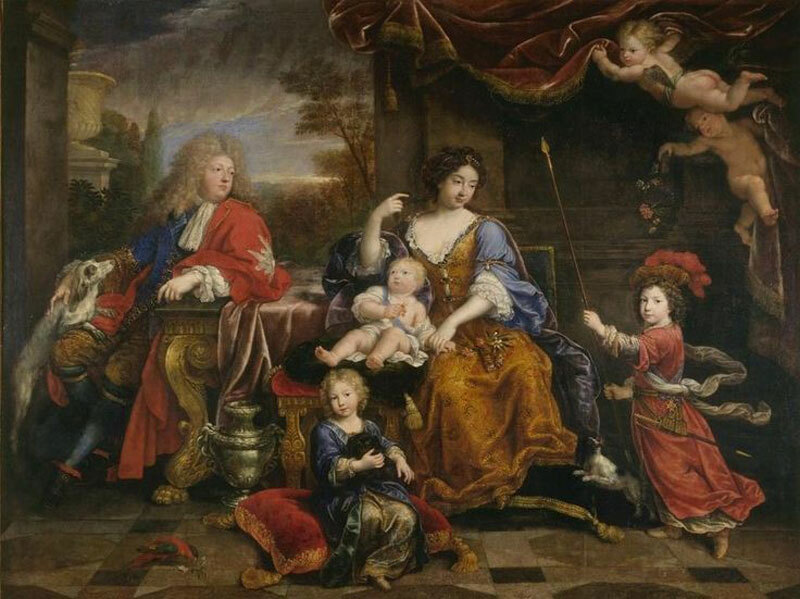 Louis XIV certainly took his role to ensure the future of the Bourbon dynasty very seriously, yet of his six legitimate children with Queen Marie Thérèse (he is also thought to have had roughly 17 illegitimate ones) only his eldest son reached adulthood. In 1687, Pierre Mignard produced a jolly group portrait of the Grand Dauphin and his own family. It presents the crown prince and his wife in a casual atmosphere, delighting at their three sons and heirs: Louis, Petit Dauphin; Philip, duc d’Anjou (later Philip V of Spain); and Charles, duc de Berry. The picture shows a royal clan confidently facing the future – however, by 1715, all but Philip were dead, and he had moved to Madrid. 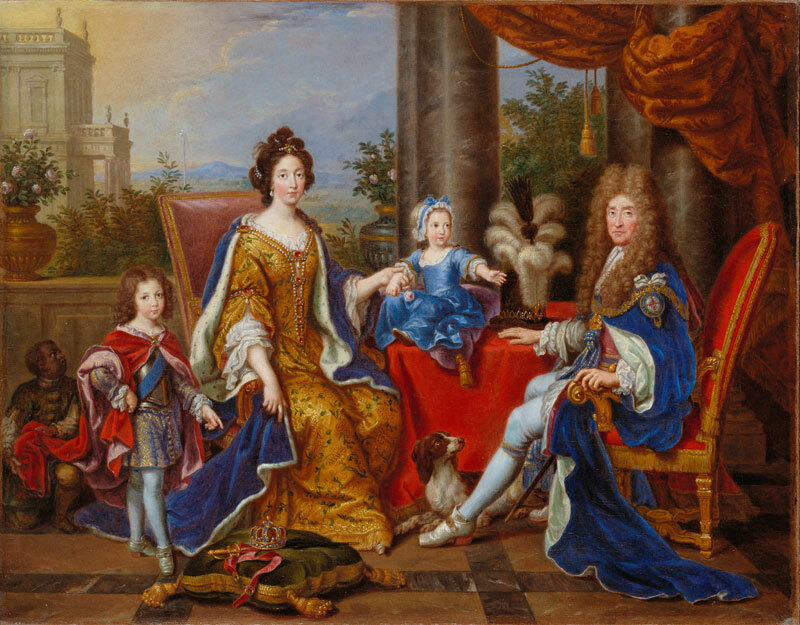 How relaxed the Grand Dauphin’s family portrait seems compared to Mignard’s last work depicting the family of the exiled King James II. The pictured version, from the Royal Collection, is a small yet finely executed oil sketch for a much larger composition in a private collection. The Stuart king’s family, which found refuge at St Germain-en-Laye, is represented with distinct solemnity. This is not a friendly group portrait, but the stately image of a royal family anxious to return to Britain and claim its crown. Why do we so often overlook 17th-century portraits of men and women with wigs? As I said in my first article, we tend to dismiss them as the brainchild of the sitters’ vanity. Is it the tangibility of these pictures that makes them appear banal? Or is it that we don’t even consider them as tangible? Mignard’s works are so much more than family portraits: they comprise components of history paintings, Arcadian landscapes and most importantly religious scenes. The great theatricality with which Mignard and his contemporaries captured the French royal family is akin to the great altarpieces of the Counter-Reformation. They bear witness to the strong emphasis Louis XIV put on the link between France’s rulers and the Catholic Church. I started this series with an image by Hyacinthe Rigaud, and I would like to end with one: Louis XV’s first official state portrait. How to portray a five-year-old king, without making it look like a farce? Rigaud gives the answer. 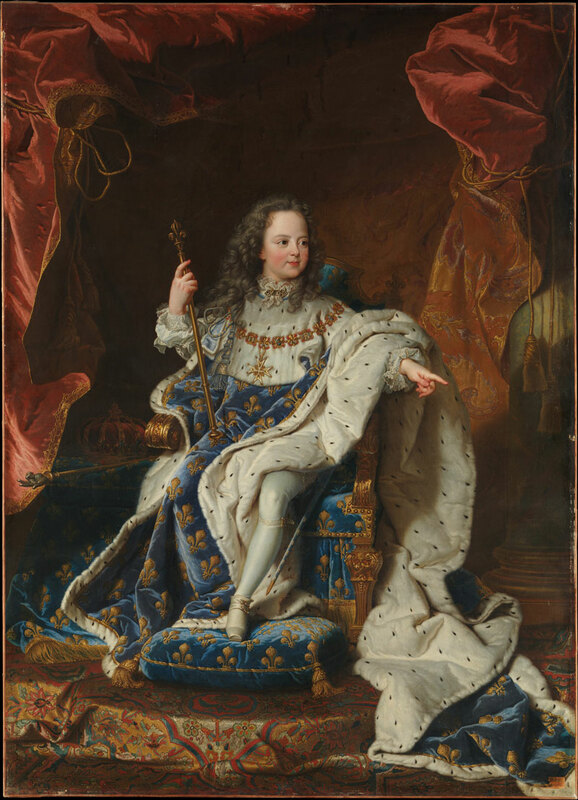 He shows the young sovereign seated in a fictional setting almost identical to that of the artist’s 1701 Portrait of Louis XIV. The scale of the throne, the crown jewels and insignias has been adjusted to fit the new king. Even the column on the right appears to have been downsized proportionally – an architectural licence conveniently concealed by the elaborately draped curtains. Dressed in his coronation robes (even though the actual coronation would not take place until 1723), Louis XV is represented as a reincarnation of his great-grandfather. The king’s angelic appearance, the focus on his pointing hand, the low viewpoint – all these are means by which Rigaud emphasises the semi-divine status of French kingship. At its very centre, the picture features the badge of the Order of the Holy Spirit with its white dove – the same white dove we find in religious paintings to depict the link between Jesus Christ on Earth and his Father in Heaven. Pictures of royal children were always a challenge. To enhance the dignity of their sitters, 16th- and 17th-century painters often represented young or future monarchs with unnatural seriousness. Rigaud does quite the opposite. The Louis XV he portrays is as innocent as most depictions of the Christ child – a comparison that some might argue implied that Louis XV could have expected a tragic end. I would not go so far. To me, Rigaud attempted to create an image of hope and of a bright future ahead. It is a picture that suggests a circle of life, death and renewal. Indeed, because Louis XIV was so old and Louis XV so young, images of the Sun King’s death inevitably invite associations with resurrections. The very moment the elderly sovereign died, his Master of Ceremony, the duc de Bouillon, stepped out on the balcony of the king’s state bedchamber, a black feather at his hat and declaring: ‘The King is dead.’ A few moments later, he returned to the balcony wearing a white feather, now proclaiming: ‘Long live the King!’ Rituals such as these aimed at giving legitimacy to France’s hereditary monarchy. Images such as the ones created by Rigaud – of both Louis XIV and Louis XV – are the revealing illustrations of these rituals. Wolf Burchard is a specialist on 17th- and 18th-century patronage. His online series about the legacy of Louis XIV expands on his feature article ‘Blinded by the Sun’ (first published in Apollo; March 2015).